Try the other front wheel bearing. I had an Audi where I was certain the OSF bearing had gone due to a noise, I had it changed and the noise was still there. Louder when turning right. Changing the other bearing sorted it. Turns out wheel bearing noises can work the opposite of what we normally expect depending on where the wear is located on the failing bearing. +1 for change the other wheelbearing. I had a BX which *definitely had bearing noise from the drivers side. I changed the drivers side wheel bearing then the driveshaft support bearing before in desperation replacing the passenger side wheel bearing. Cured it. If you've tried a different set of tyres then it's (probably) not that. I'd try the other wheel bearing too, the brakes alter the sound as when they are applied they hold the wheel steady. Zowie! Thanks for the suggestions Teen Angels! OK - I'll order a bearing for the other side - sounds like it's worth replacing that then. Wheel feels rock solid and not at all gritty to rotate. The one I replaced (to no effect) had felt the same so I kind of thought it would be a waste of another bearing. Having read the anecdotes here, it still sounds worth trying - cheers. I'll need to make up the tool for torquing up the bearing rings I think - unless anyone knows a source for these (same as for a mk1 Shogun?). If they're not readily available then I reckon a deep hole cutter with a couple of lugs welded on should do the trick. Tyres - I did try another set and the sound 'changed' but was still present. I recall I first became aware of it with the previous set of tyres which were really just 'SUV Cross' type things (so not very knobbly). I guess it's still worth moving the current ones around to see if it changes. It may sound like I have unlimited funds for tyre buying - but I just seem to pick them up off ebay when an MOT is due (Ã‚Â£25 for the current set of four). I have a bit of a dilemma with the Delica. It's been off the road a while due to having to do lots of work on our house and not having time to MoT the van and stuff like that. I now have a garage I can put it in (yes, it required an over-size garage door) so I thought I'd (slowly) tackle the rusty roof. 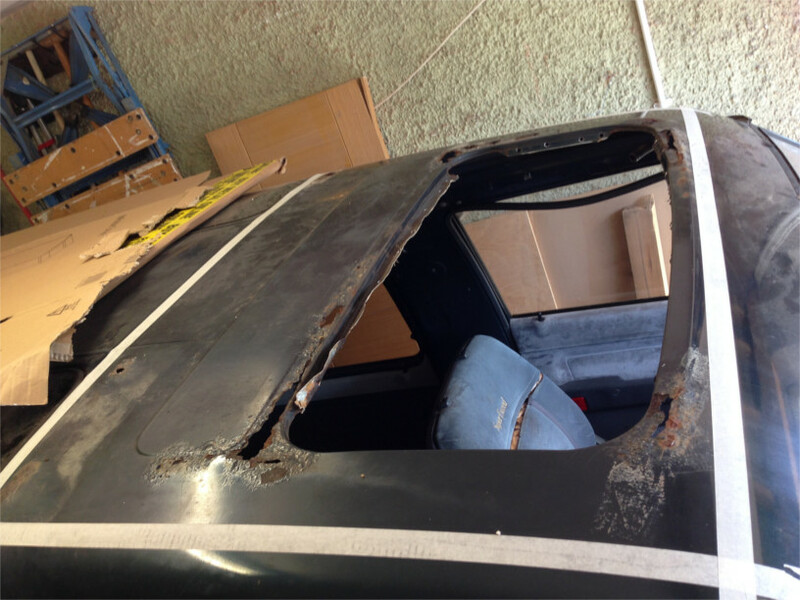 Common problem with the 'Chrystallite' roof as the skin was bonded to the frame before the paint was applied. When the glue in the bonds cracks it allows condensation to get onto the exposed steel of the roof skin and it rots from the inside. First for attention is the sunroof at the front. This is really bad and it's now leaking rainwater into the cab. I'm in two minds at the moment as to whether I should repair the areas around here and retain the sunroof or whether to just do away with the whole thing. 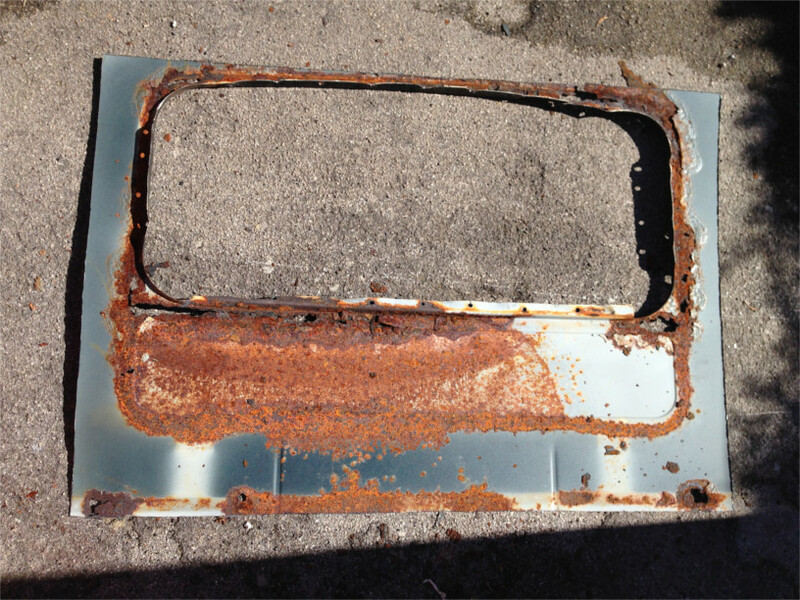 With various layers of steel here and the box that the sunroof folds back into, this area is quite complex. It will be a bit of an arse ache to repair. 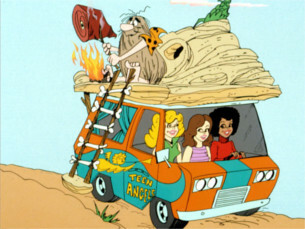 However, keeping the sunroof would retain the whole mad 'Super Exceed' feel of the Deli. If I plate it all over it would be easier and less prone to leaks and stuff in the future, but I suspect it'll be very difficult to make it look right (keeping such a large plate nice and smooth). At the moment I'm leaning towards the 'repair around it' option and retaining the sunroof, though that will mean it probably doesn't see the road again until next winter (I really should pull my finger out!). There are various other patches to fix on the rest of the roof but this one is going to be the awkward one. 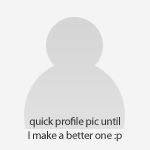 Anyone done anything similar to either of these two options? The shitters choice would be plate over it then vinyl roof it. Now, that's a very good idea. Trouble is, I really like the flashy electric blinds on the roof lights and I'd lose those with a pop top. Hmmm, I'll have to give this some thought. Did you sort out the mystery noise? Plus eleventy on a pop top, its a whole new world of pain! That's something else I need to do - once it's waterproof. Cheers for that Mr Foot. 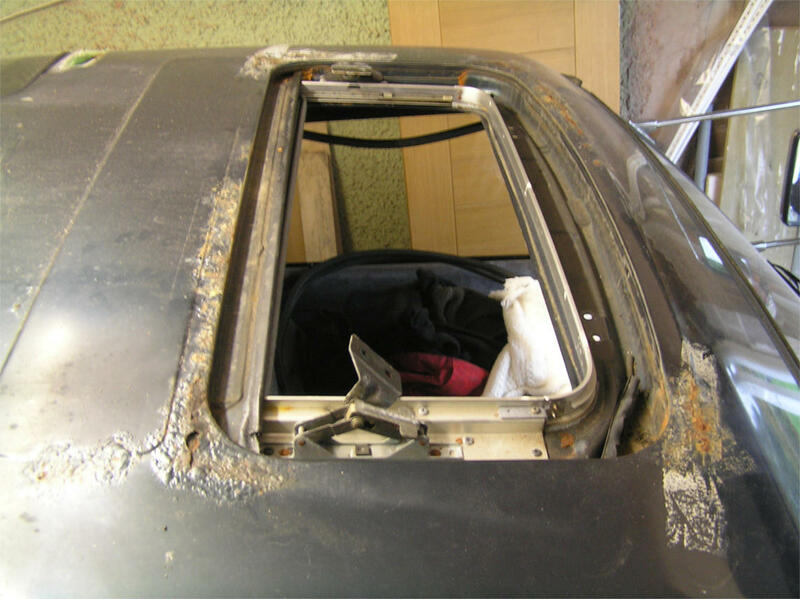 Do you mean repairs to the sunroof aperture are painful or the fitting of a pop top? Fitting a pop top isn't that bad if the roof itself isn't total dogshit. I've fitted about a dozen to T5s. They were all total dogshit, but some laughably so in that they fitted OK to start with but when left up in the sun for 4 hours they warped so much that they had to be replaced as there was a 3" gap at each end. If you can get a proper original roof with all the fittings and a load of photos of how it was fitted then it's not that bad of a job, but you'll probably need to get a new canvas, depending on how the originals are fitted. "Universal" ones are about Ã‚Â£100. Shhh! Don't remind me. One day I'll have a chance to drag it home (now I have a home). Just hope it doesn't fall in half when I do. No That's something else I need to do - once it's waterproof. Cheers for that Mr Foot. Do you mean repairs to the sunroof aperture are painful or the fitting of a pop top? 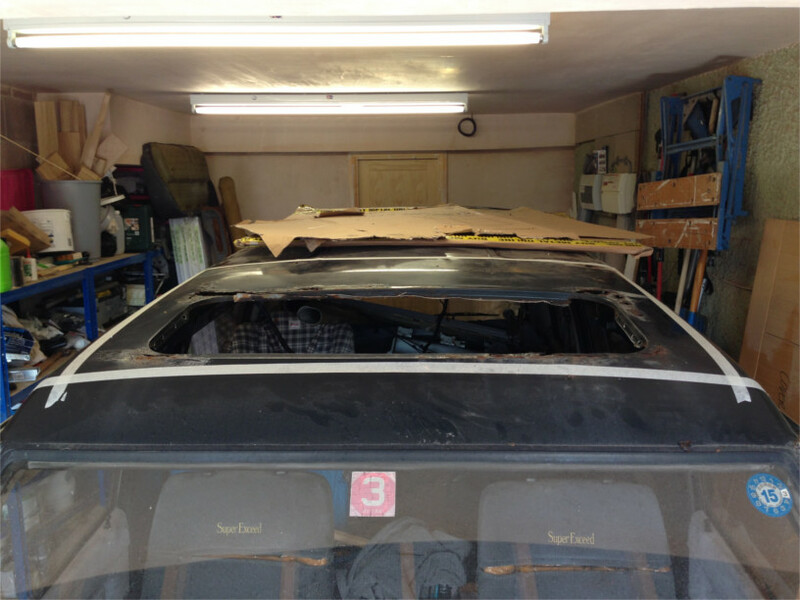 Just fitted a Dormodile roof to our tin top t2. Now we get mysterious drips of condensation from amongst the folds of the bellows. Now we get mysterious drips of condensation from amongst the folds of the bellows. Biggest problem with the pop top is finding one. I've been looking for ages for one to fit to my LWB L300. There's a guy on retro rides fitted one from a Mazda Bongo but looked a lot of hassle. 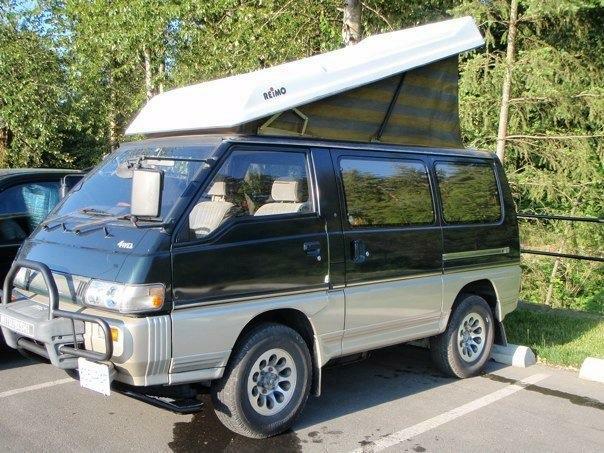 I'd sourced one off an hiace lwb but I declined in the end as I've too many projects. And again it looked like too much hassle. 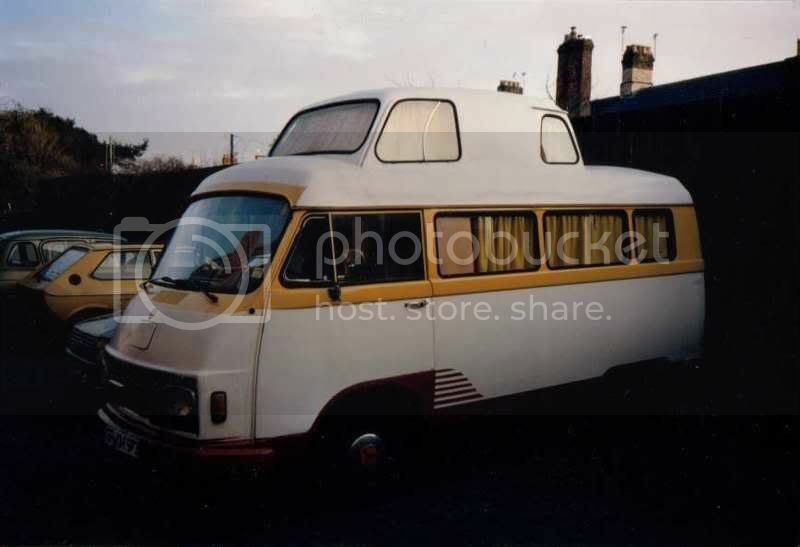 Probably best just to plate over it and fit a vinyl roof ! That roof's going to be a lot of work even taking the easiest bodgiest option. Anyone remember the old Volkswankers with homebrew high tops using the top half of a Mini? Get photo-shopping with Micras, PT Grusomes etc. There must be a stylish and functional choice of combination out there, when it's done I'll have 27 and 43 please. Oo - I meant to add this earlier. Apart from the propensity for roof rust, I've found the Delica is really nicely put together with lots of neat touches. 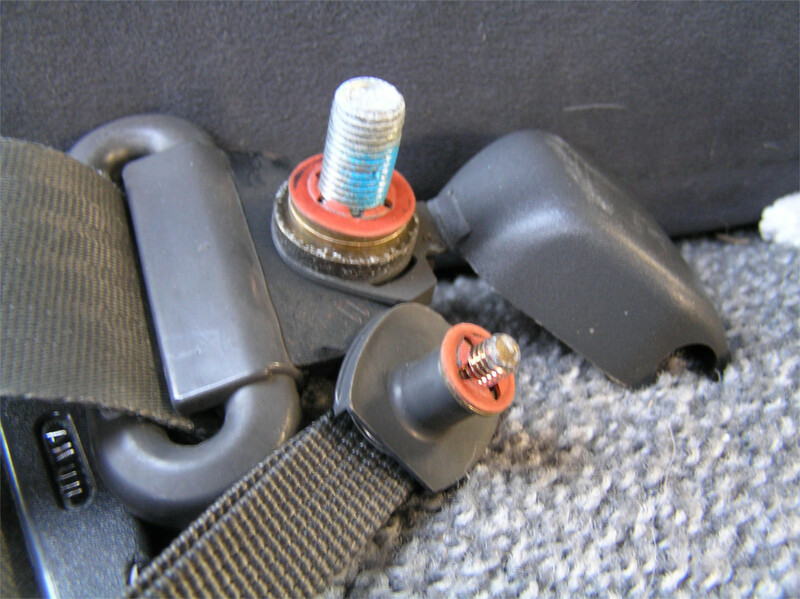 The bolts that hold the seat belt mounts pass through some trim panels. If the washers on these bolts were to drop off during removal or refitting, it would be a right old palaver to have to retrieve them from behind the trim. It looks like the designers thought of this and added these red fibre washers that are a nice tight fit and keep the steel washers from sliding off. I thought I better get on with this roof. I can't be bothered with that, and the sunroof is pointless anyway. So I think I'll just plate the whole roof. See the cross member just aft of the sunroof? I've highlighted the worst rot here - a couple of holes in the roof skin here too. So, I reckon, my best bet is to replace all this area with one sheet. Otherwise I'll just be patching both areas then stitching the two patches together. One big sheet will need less welding wire overall. I'm thinking I can cut this out and 'joddle' the edge so it's a step down. Then cut the replacement sheet to shape and drop it into the recess. Alternative would be to joddle the edge of the sheet itself and offer it up from the inside - but somehow that feels like it'll be more awkward. Anyone done anything similar and can share their experience? 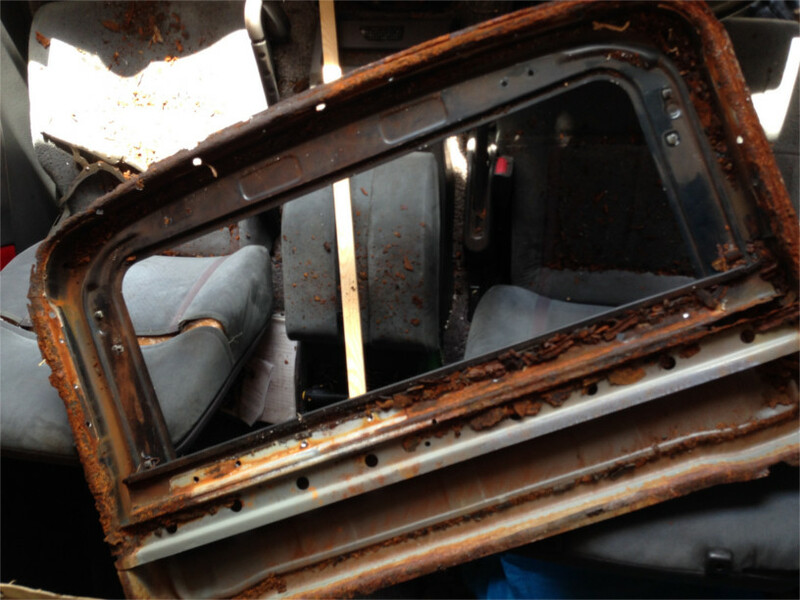 Could you cut this section out of a scrap non sunroof delicia? Getting that compound curve out if sheet steel will be hard . I also suspect there'll be another crossmember that may help with strength and fit ment. I'd may be have a look at some of the high end glues to fit it as you'll have no heat warp age issues. Bmw bond all their panels including the roofs when in for repair . I'm unlikely to find a spare roof I reckon. Besides which, I've just bought a big sheet of Zintec to go in the gap . 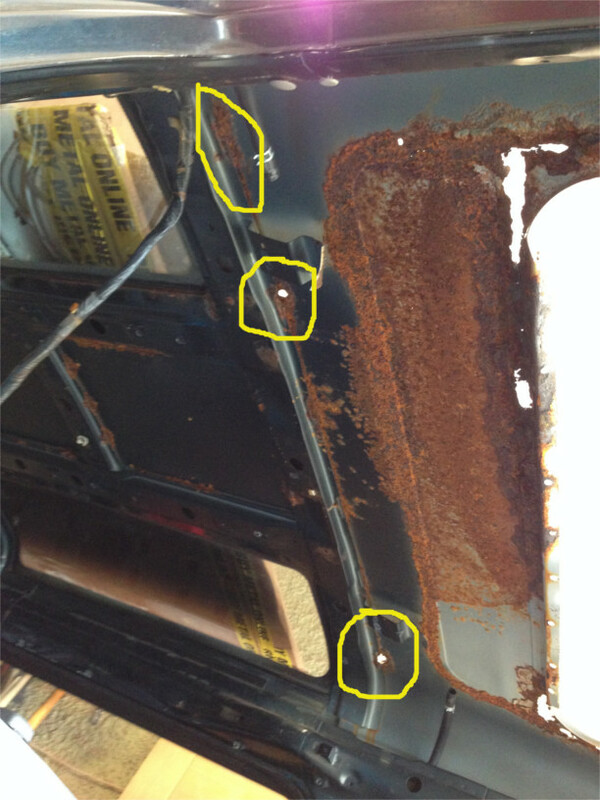 I'll make up a cross member of some sort to replace the strength that was in the sunroof frame. I might even just tack the frame to the inside and leave the option to open it up again in the future maybe. Stupid suggestion: bond in a glass roof nicked from a Renault Scenic or similar. Would need a frame making up/welding in, to give a nice anchor for the bonding I reckon. Also, chances of matching size/double curve = 0.000001%. Nice idea though. 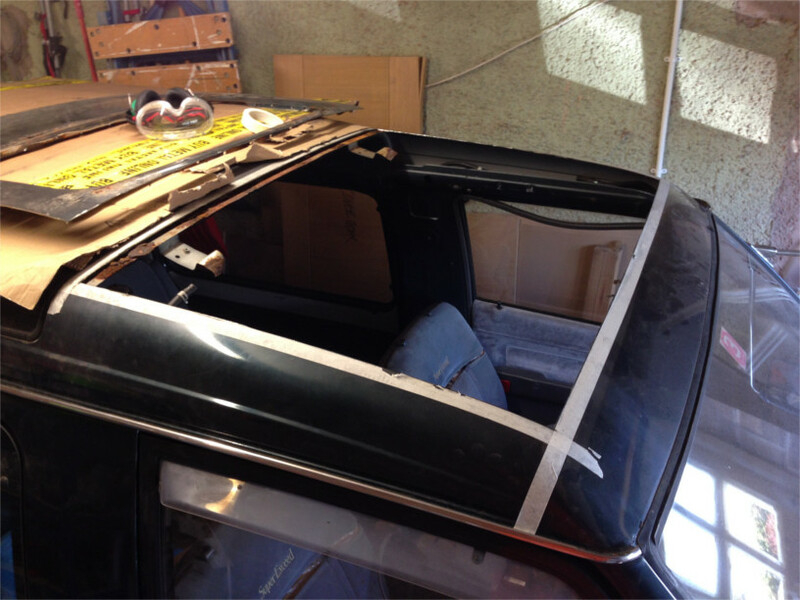 It's nice and easy to work on the roof with the sunroof removed. It's only just occurred to me that once I put my proposed panel in place it'll be a lot more difficult to weld it from the outside. If I did that on the Delica I wouldn't ever be able to get it back out the garage. 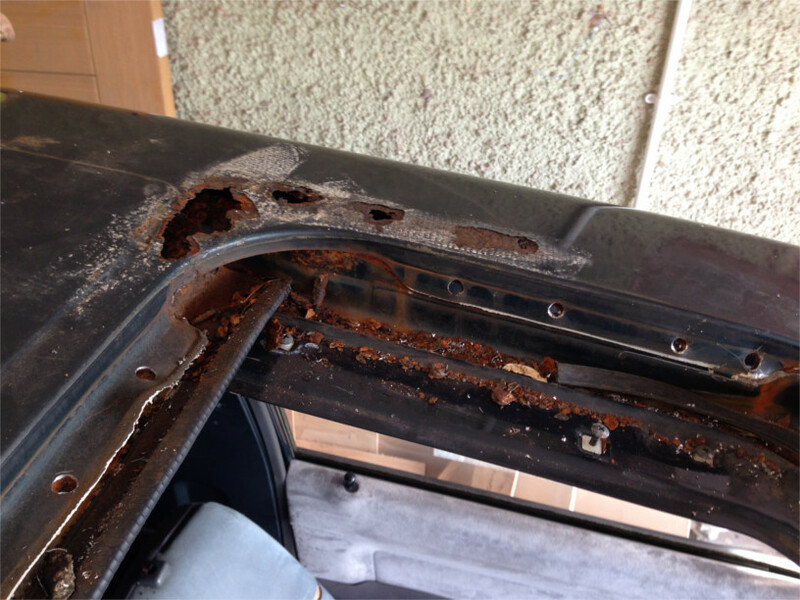 If you are one of the dozens of forum members who failed to dissuade me from turning my Delica into a convertible today, hang your head in shame. Consider whether you should make up for your absence in my hour of need, perhaps by buying a roffle ticket for my lovely mobile skip? Look at the state of this roof panel that came off. Looks like a ginger sponge. Just thinking 'outside the box', how about welding or bonding a lip around the perimeter of the hole, then bonding in a sheet of perspex, or the equivalent. It's available in many shades, so you could go for a tint. Whatever you do, good luck, you must be brave tackling that job! Perspex is not going to work because it will only bend in one plane unless you make a plug, get a big oven and drape form it.